When studying the five senses, there’s some great scent activities, but you may not want to do too many in one day. I personally get very headachey when exposed to too many scents in a short period, especially essential oils and artificial smells. Scent bottles: First, you need airtight containers: You can use spice bottles from the dollar store where they have to flip the lid open to smell it (a small motor challenge for some), or ziplock bags, or yogurt containers with slits cut in the lid (kids can squeeze the sides and scented air will puff up through the slits in the lid), or two cups taped together with holes cut in the bottom. Guess the scent (need to use opaque containers so they can’t see it). Have photos of the items in the containers. Kids smell the container, then place it on the picture of the item they think it matches. When they’re done, they can open the containers to check their answers. In our class, we used spice bottles that they sorted into yummy and yucky, and had four dixie cups where they were asked to guess what was inside (toothpaste, pickle, cleaning cloth, and dog food). Artificial scents: Bring in a variety of items with artificial scents. Do they smell like they’re supposed to? If something smells like food, does that mean it’s edible? If it’s a candy with a banana scent, then yes. But, if it’s lip balm, or a marker, or a scratch and sniff sticker, then no matter how much it smells like strawberries, it doesn’t mean it’s good to eat! That smells bad! An interesting activity to put together would be bad smelling things: sour milk, over-ripe fruit, smelly permanent markers, sulfur, those “natural gas smell” cards that gas companies send out, bad smelling household chemicals…. be sure all the scents are safe to breathe in! Kids could smell them, and then talk about how bad smells can be a sign to us that something isn’t healthy for us to be around. 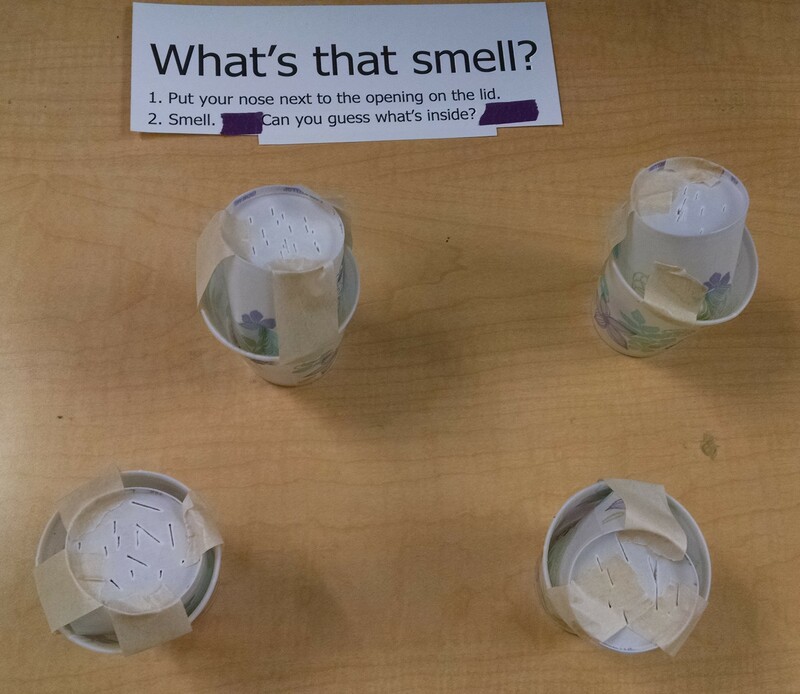 The challenges with this activity would be to ensure there was nothing harmful about these scents. You’d also want to be able to get rid of the scents after the activity and not have them linger in the room! Scent Memories: We know that certain scents can be very powerful in conjuring up memories for us. I’d love to come up with an activity that would play with that. I’m thinking a circle time activity where you’d open up a bag of fresh-popped popcorn and think about what memories you associate with that, or bring in some freshly baked chocolate chip cookies, and ask what the scent reminds you of… the trick would be to have a scent that would fill the room and evoke those memories. Smelly Playdough: Make playdough (here’s our favorite play-dough recipe) and mix in small amounts of extracts such as vanilla, peppermint, cinnamon, anise. Color to match. Whose Nose? One of the big ideas for kids to get is that we use our nose to smell with. 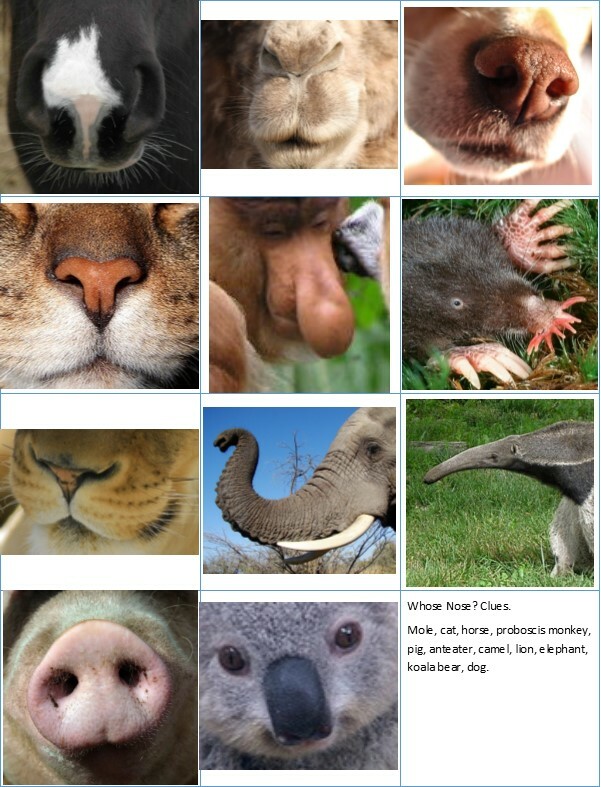 This free guessing game PDF shows several animal noses. See if your child / students can guess which animal is which. Sensory tables: In the water table, add fragranced bubble bath, rose water, or lavender essential oil. For the sensory table, make cloud dough; flour, vegetable oil, and cocoa powder… smells like brownies! Share the ideas that smelling our food helps us enjoy it more. When we have a cold and our nose is plugged up, we don’t taste as much. Sometimes people lose their sense of smell due to injury or illness, and they enjoy food less. Unsweetened Cocoa Use baker’s chocolate or cocoa powder. Have them smell it… mmm, chocolate! Then have them taste it. Yuck, bitter!! 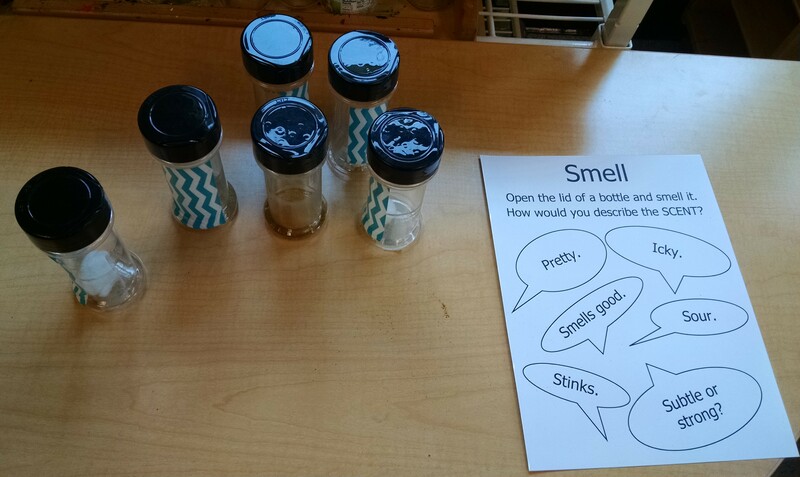 Scent hike – tell about how animals use scent to track what they want to find. Tell them to imagine they are an animal that really loves to eat candy canes. As they go through the woods, they will search for the scent, and turn to follow it as they go. Then on the hike, everywhere you need to decide whether to turn right or left, place 2 dixie cups or scent bottles – one on the right hand path, one on the left. In one, have a cotton ball saturated in peppermint oil. In the other, have a plain cotton ball with no scent. They sniff both, and turn the way the peppermint tells them to turn. At the end of the hike, hand out mini candy canes to all. Science of Smell: We smell something when it releases molecules into the air that we are breathing in – when the molecules reach the back of our nose, our brain interprets the scent to see if we can recognize it. Human beings recognize about 3000 – 10,000 odors, mostly either food cues or danger cues. There may be as many as 400,000 detectable odors. We smell through our nose, but we can also smell things we are holding in our mouths, as long as we don’t plug our nose… it’s the air circulation which brings the smell up into our nose. We smell things that are volatile – releasing molecules into the air. We don’t smell a metal object because it is not volatile. Our sense of smell quickly habituates – when we first enter a room, we notice all the smells, but then over time our brain adapts to them and we stop noticing. Our sense of smell protects us: we smell when something is burning so we can stay safe from fire. We notice when milk has soured and that prevents us from drinking the milk and getting sick. Skills to teach – Sniffing and Wafting. Kids know how to sniff. Do they know why it works? It is easier to detect scent molecules in swirling air than in a smooth flow of air. So if we just inhale through our nose, we smell a little. If we sniff in air in little puffs, we detect more of the odor. Wafting is a good skill to teach . If they’re smelling something for the first time, they may not want to bury their nose in it and take in a deep sniff. Instead, they can cup their hand, and use it to scoop some of the air from above the object up to their nose. Book: Follow Your Nose: Discover Your Sense Of Smell by Vicki Cobb. It’s for ages 8 – 10, so way too old for my class, but it was an engaging read for me as an adult that really helped to ground me in the science of smell, so I could then better teach the kids. 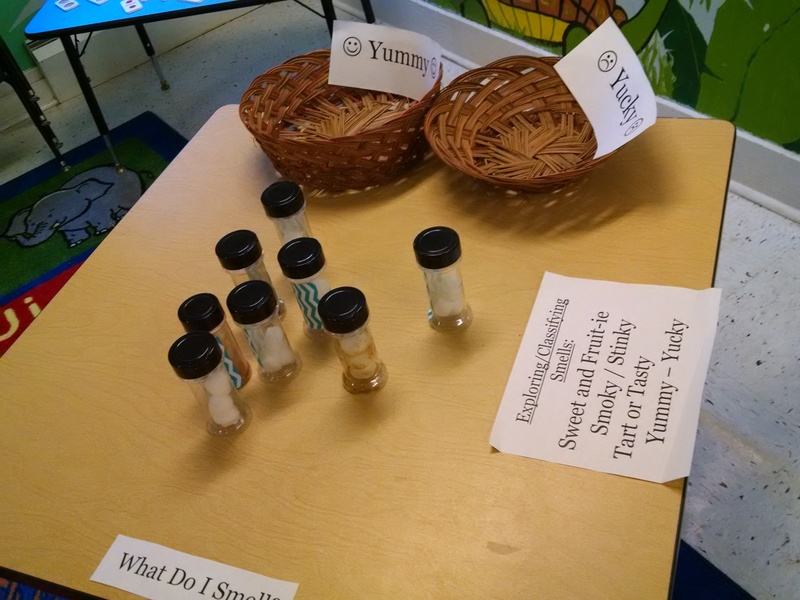 For lots of great books about the five senses for preschool to first grade level, check out this post.